Prepare yourselves for the ultimate treat. Head to Ballarat this March and enjoy the best in local live music while enjoying the finest food this region has to offer. Ballarat Backyard Tasters is a free event held over the first two Fridays in March, featuring local musicians, tantalising food stalls and creative exhibitions. 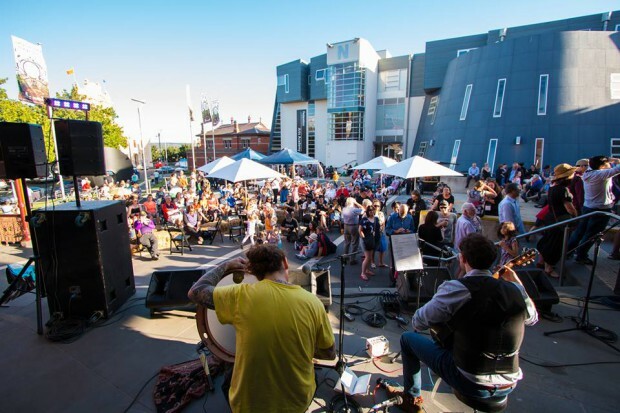 Held right in the centre of the creative city of Ballarat, this high-energy event is ideal for families and anyone who enjoys live music. With a ‘rocking’ atmosphere this event always gets you dancing. Or you could choose to sit back and take in some tunes after a hard day’s work. This year’s event features a great new line up of entertainment, including seven-piece trubaĉi and Balkan folk-pop band based in Ballarat – Wunderhorns. Joining the Wunderhorns on 1 March is Fat Tuesday, Moonshine Blues, A Miner and Meraki Minds. Why not return on 8 March to see Ska Union, a nine-piece ska ensemble. Jessica Connell will also take to the stage, followed by Bar Choir, FLOC, Nervous Pedestrians and Stray Black. A variety of food vendors will also be onsite both Fridays.